The 100Newton Life Jackets reduce the risk of drowning for both swimmers and non-swimmers in sheltered waters in most conditions. Specifically designed to turn the unconscious user face up and support the head. It provides an improved fit and maximum safety. A large flotation collar supports the user’s head for keeping the head out of water and its design provides the user’s return on time. The life jackets have a crotch strap for keeping the vest securely whilst in the water, while the small size also features fabric pampers. It includes, one webbing fastener, whistle, plastic zip and SOLAS retro reflective tapes. An end rope with plastic button is fixed at the end of each life jacket for adjustable wearing. 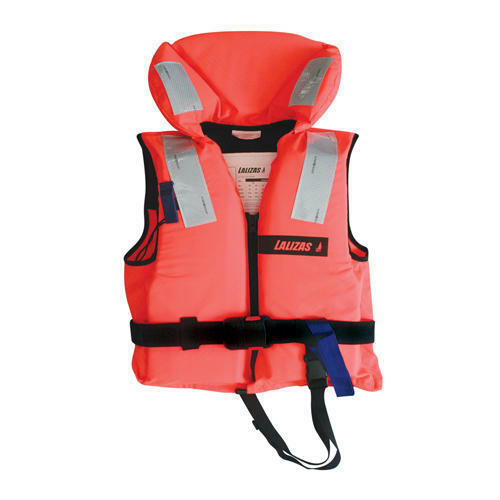 Approved to the latest European standards for 100Newton life jackets, ISO 12402-4. All of its raw materials are certified per ISO 12402-7 and ISO 12402 -8, for higher strength, quality and durability. It is available in 6 sizes, in fluorescent orange colour. Established in the year 2006 at Thane (Maharashtra, India), we “Oriental Enterprises” are recognized as the foremost trader, distributor, and retailer a wide range of Safety Gloves, Eye Protection, Head Protection and Face Mask, etc. These products are manufactured using supreme quality raw material and the most advanced techniques by our prestigious vendors in order to match the global quality standard. Further, the offered range is tested on various quality parameters by their experienced quality controller team. Our offered range is widely applauded by our clients due to their incomparable features like best in use, precise dimension, reliability, shrink resistant, high strength and low maintenance. In order to meet various needs of clients, we offer these products to various specifications. Our precious clients can avail these products from us at market leading prices. Under the visionary guidance of our mentor “Isa Bape” (Partner), we have been able to place ourselves at the peak of success. His rich industry experience and expertise enables us to gain a commendable position in the domain.